You know Tetris, but do you know how to party? 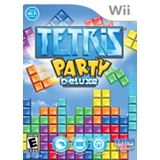 Tetris Party Deluxe builds on the previously released Tetris Party for WiiWare by adding new modes and features to enrich the overall game play experience. With more than 20 exciting modes, online battles, and multiplayer fun for groups of friends and family, Tetris Party Deluxe is a must-have for Tetris and puzzle fans. Field Climber now includes an "Everest" option for added challenge with endless play. Help the climber reach the goal by placing Tetriminos accordingly. Collect all flags along the way and don't let your climber get crushed! Break a sweat - Use the Wii Balance Board (sold separately) in specially-marked modes. Lean left and right to move the Tetriminos left or right; lean forward or backwards to increase the drop speed; squat to rotate them!